The 4 permanent exhibition rooms cover 900 m2. A room of 360 m2 is reserved for temporary exhibitions. Consult the museum’s opening hours by clicking here. – The price of the hiring of the panels of exposure is fixed at 2,000 F CFP per panel and per week. The rental period is defined as 7 consecutive days, any week started being due. – The panels must be returned in good condition, otherwise and after finding, their restoration will be the responsibility of the lessee. – A deposit of 6,000 F CFP will be required per rented sign. 2. Pedestals, bells, supports and manikins: (price fixed by the museum director). 3. Exhibitions on panel or museum kakemonos: (price fixed by the museum director). For the equipment mentioned in 2. and 3., a deposit will be required, which will be calculated according to the fixed rental price. In the event of loss or damage to the equipment described above, its replacement will be provided at the lessee’s expense and at the cost price on the day of redemption. No delivery will be made. Similarly, no provision outside the island of Tahiti will be allowed, unless approved by the director. In this case, the transport of the equipment will be under the responsibility of the lessee. 1.3. Gardens: 25,000 F CFP half day. 2.2 Temporary exhibition hall: 10,000 CFP per half day. N.B. 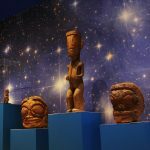 The photographs and filmed shots may be authorized free of charge as part of operations entirely dedicated to the promotion of the Museum, its collections or a promotional operation for Polynesia as part of a production supported by the Country. For some temporary exhibitions, photographs and shots are prohibited. – 70,000 CFP the evening. – 60 000 F CFP the evening. – 15 000 F CFP the evening. – Month – during the day (Tuesday to Sunday – 4 hours a day): 70,000 FCFP / month. The temporary exhibition hall is rented only as part of the organization of exhibitions. In the case of a rental over a period of more than 3 days, a sliding scale may be granted by the director. Monthly rent of 4,000 CFP per linear meter (shelf) per month subject to availability and disinsection, unless otherwise agreed. – The evening is a continuous 4 hours between 18:00 and 22:00. – All rentals of space and equipment are payable in advance. – The management reserves the right to refuse any rental that would be contrary to the proper functioning or the reputation of the museum. 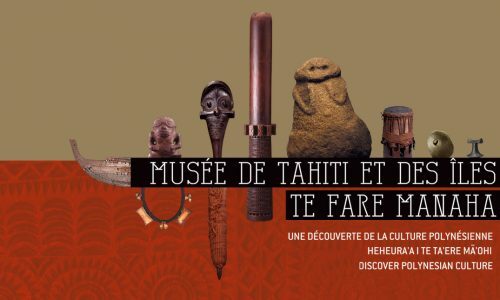 Dedit: in case of cancellation by the lessee after payment of the rental fee, they will remain acquired at the Museum of Tahiti and the islands – Te Fare Manaha except in all cases of force majeure or related to climatic conditions. Please contact us to obtain prices for publications, items for sale and reproduction rights for images. See the decree n ° 351 CM of March 19, 2013 modifying the decree n ° 213 CM of February 21, 2013 approving and making enforceable the deliberation n ° 04 / MTI / 2013 of January 8, 2013 of the Museum of Tahiti and the Islands – Te Fare Manaha, fixing the rates of the services and the rights of reproduction of the images.